You may receive updates from East Timor and Indonesia Action Network, the sponsor of this letter campaign. Join the East Timor and Indonesia Action Network (ETAN) in Supporting S.Res. 273. 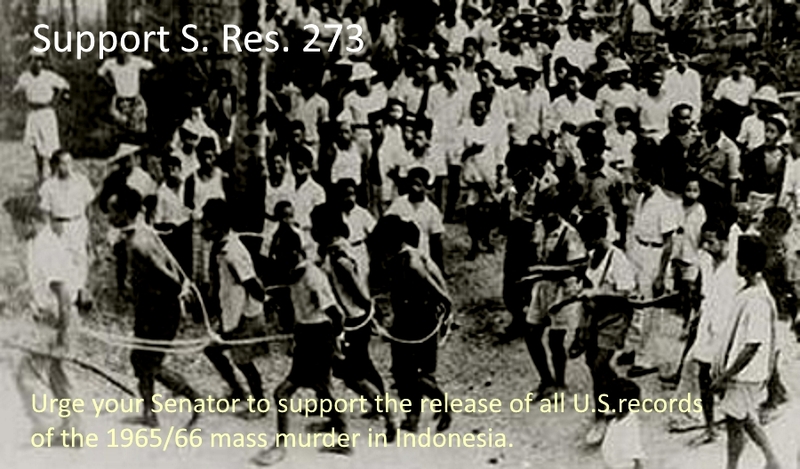 Urge your Senators to cosponsor Senator Tom Udall's (D-NM) resolution condemning the 1965-1966 mass murder in Indonesia and expressing concern about the lack of accountability for these crimes. These crimes were featured in the Oscar-nominated documentaries The Act of Killing and The Look of Silence. S.Res. 273 urges Indonesia to consider a truth, justice, and reconciliation commission to address crimes against humanity and other human rights violations and calls on the U.S. government departments and agencies involved in developing and implementing policy towards Indonesia at the time to locate, recommend for declassification, and make available to the public all records from that time. Read more about the S.Res. 273 here: http://etan.org/ne ws/2015/10senate.htm. Go here, for more actions you can take on this issue. For more background and information, see here. THE MASSACRE of up to 1,000,000 communists, leftists, ethnic Chinese, and others in Indonesia in 1965-1967 is a key event in modern Indonesian political history, but it remains mostly a footnote for most in the United States and elsewhere. The Oscar-nominated documentary THE ACT OF KILLING shocked audiences as perpetrators of the mass murder reenacted their violence. The film has fueled a debate within Indonesia and drawn attention internationally to events unknown to many; events that the U.S. facilitated and cheered at the time. THE LOOK OF SILENCE flips the story by following Adi Rukun's investigation into the death of his older brother who was murdered during the violence. THE LOOK OF SILENCE was also nominated for an Academy Award for best documentary. These powerful films tell us as much about Indonesia today as they do about the past. However, any evaluation of the events of 1965-1967 must include a discussion of the role of Western powers in the violence, especially the United States. The East Timor and Indonesia Action Network (ETAN) continues to call for accountability for those in the West who encouraged and assisted in the mass violence in Indonesia from 1965 on. The full truth must come out; the U.S. should declassify all files related to Suharto's U.S.-backed seizure of power and the murderous events which followed.